NASA’s Kepler mission has discovered its first Earth-size planet candidates and its first candidates in the habitable zone, a region where liquid water could exist on a planet’s surface. Five of the potential planets are near Earth-size and orbit in the habitable zone of smaller, cooler stars than our sun. Candidates require follow-up observations to verify they are actual planets. Kepler also found six confirmed planets orbiting a sun-like star, Kepler-11. This is the largest group of transiting planets orbiting a single star yet discovered outside our solar system. The discoveries are part of several hundred new planet candidates identified in new Kepler mission science data, released on Tuesday, Feb. 1. The findings increase the number of planet candidates identified by Kepler to-date to 1,235. Of these, 68 are approximately Earth-size; 288 are super-Earth-size; 662 are Neptune-size; 165 are the size of Jupiter and 19 are larger than Jupiter. Of the 54 new planet candidates found in the habitable zone, five are near Earth-sized. The remaining 49 habitable zone candidates range from super-Earth size – up to twice the size of Earth – to larger than Jupiter. The findings are based on the results of observations conducted May 12 to Sept. 17, 2009, of more than 156,000 stars in Kepler’s field of view, which covers approximately 1/400 of the sky. “The fact that we’ve found so many planet candidates in such a tiny fraction of the sky suggests there are countless planets orbiting sun-like stars in our galaxy. We went from zero to 68 Earth-sized planet candidates and zero to 54 candidates in the habitable zone, some of which could have moons with liquid water,” said William Borucki of NASA’s Ames Research Center. Among the stars with planetary candidates, 170 show evidence of multiple planetary candidates. Kepler-11, located approximately 2,000 light years from Earth, is the most tightly packed planetary system yet discovered. All six of its confirmed planets have orbits smaller than Venus, and five of the six have orbits smaller than Mercury’s. The only other star with more than one confirmed transiting planet is Kepler-9, which has three. “Kepler-11 is a remarkable system whose architecture and dynamics provide clues about its formation. These six planets are mixtures of rock and gases, possibly including water. The rocky material accounts for most of the planets’ mass, while the gas takes up most of their volume. By measuring the sizes and masses of the five inner planets, we determined they are among the lowest mass confirmed planets beyond our solar system,” said Jack Lissauer, a planetary scientist and Kepler science team member at Ames. “The historic milestones Kepler makes with each new discovery will determine the course of every exoplanet mission to follow,” added Douglas Hudgins, Kepler program scientist at NASA Headquarters in Washington. All of the planets orbiting Kepler-11 are larger than Earth, with the largest ones being comparable in size to Uranus and Neptune. 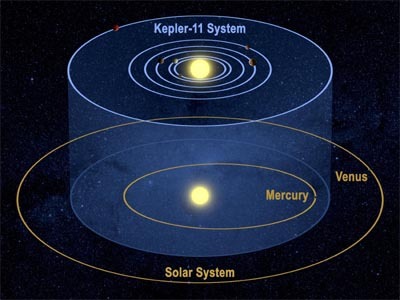 The innermost planet, Kepler-11b, is ten times closer to its star than Earth is to the sun. Moving outward, the other planets are Kepler-11c, Kepler-11d, Kepler-11e, Kepler-11f, and the outermost planet, Kepler-11g, which is half as far from its star as Earth is from the sun. The planets Kepler-11d, Kepler-11e and Kepler-11f have a significant amount of light gas, which indicates that they formed within a few million years of the system’s formation. Kepler, a space telescope, looks for planet signatures by measuring tiny decreases in the brightness of stars caused by planets crossing in front of them. This is known as a transit. Since transits of planets in the habitable zone of sun-like stars occur about once a year and require three transits for verification, it is expected to take three years to locate and verify Earth-size planets orbiting sun-like stars.